Ray Wolfinger was a top notch scholar, mentor, and contributor to the discipline. He stood out as one of the very best Ph.D. students of one of the very best political scientists of the 20th century, Robert Dahl. Ray and his colleagues at Yale University contributed to a transformation in political science, bringing the systematic study of political behavior to the forefront, and using the behavioral approach to answer important questions regarding the exercise of political power in a variety of settings: in cities, in Congress, and in elections. Later Ray became one of America’s foremost students of voter turnout and played a crucial role in making the political science department at UC Berkeley one of the best in the world. His many books and articles – often co-authored with his graduate students – set multiple agendas for future generations of scholars and students. Ray was born in San Francisco on June 29, 1931. His father died when Ray, an only child, was five or six. Ray spent his childhood in the Bay Area except for two years after Pearl Harbor, when his mother, a civilian army employee, was evacuated to Salt Lake City. After graduating high school at the age of fifteen, Ray enrolled at UC Berkeley and participated in ROTC throughout college. Upon graduating in 1951 he was commissioned as a second lieutenant in the army. Rather than being sent to Korea, Ray was stationed in eastern Washington in command of an anti-aircraft detachment with orders to protect the nuclear reactor there against Soviet bombers. (A subsequent military assignment involved interdicting the road at the Three Judges Motor Lodge in New Haven in case of invasion.) A couple of years later when he was in the reserves, Ray was driving across the country and stopped in Champaign-Urbana to see an army buddy. The friend was attending graduate school in political science there and encouraged Ray to enroll. For lack of a better idea, he did. A solid C student in college, Ray found himself getting straight As in graduate school. Austin Ranney, his mentor at the University of Illinois and, much later, his colleague at UC Berkeley, advised him to finish his studies at Yale. In New Haven, Ray was in a cohort of exceptional students that included Fred Greenstein, Nelson Polsby, and Aaron Wildavsky. At Yale Ray was a student of Robert Lane, Ed Lindblom, and Robert Dahl. Dahl eventually became his mentor and lifelong friend, even attending Ray’s retirement celebration at the annual APSA meeting in 2006 at the age of 91. In 1960 Ray, newly married, worked for Representative Sidney Yates and Senator Frank Church as an APSA Congressional Fellow. He spent the following year in Palo Alto as a fellow at the Center for Advanced Study in the Behavioral Sciences. Stanford hired him as a visiting faculty member in 1961 and then in a tenure-track position in 1962. Ray spent 1964 working for the Democratic Majority Whip in the Senate, Hubert Humphrey, where his primary job was assisting with the drafting and passage of the Civil Rights Act. (He initially had a desk in Humphrey’s actual office, but was kicked out for being too messy.) During the year he conducted interviews for a book on the Civil Rights Act; he once told one of us that he had managed to interview everyone involved with the passage of the Act except LBJ and Everett Dirksen. After his return to Stanford, Ray was granted tenure in 1966 and promoted to full professor in 1970. In 1971 he was offered a job at UC Berkeley for the second time, and this time he accepted it. Ray spent the remainder of his career there, retiring as Heller Professor of Political Science in 2006. Ray’s scholarly career spanned fifty years and included over thirty collaborators. His first publication was an article coauthored with a fellow graduate student, Fred Greenstein (Greenstein and Wolfinger 1959). The paper analyzed urban and suburban partisanship in an attempt to determine whether suburban Republicanism was the result of Republicans moving to the suburbs or due to the effect of living in the suburbs on partisanship. His last publication, written with his son Nick (Wolfinger and Wolfinger 2008), was an article examining the effects of marriage and family structure on voter turnout. In between Ray authored, coauthored, or edited nine books and approximately fifty articles and book chapters, including ten pieces in the American Political Science Review. His significant scholarly contributions span multiple fields within the study of American politics, including urban politics, ethnic politics, the policymaking process, Congress, public opinion, and political behavior. Ray’s first book (Wolfinger 1974), The Politics of Progress, was described by Robert Dahl as the “companion volume” to Who Governs? The book emerged from Ray’s dissertation research, including a year of working for New Haven mayor Richard Lee. The empirical focus of The Politics of Progress was the development and implementation of urban renewal and redevelopment policies in New Haven. The central goal of the work was to test leading theories of policymaking, interest group influence, and urban politics. Scholars like Arthur Bentley, Earl Latham, and David Truman emphasized the power of organized interest groups on the policymaking process. Others like Floyd Hunter and C. Wright Mills focused on private “elites” who used the institutions of government to advance their interests. Ray found neither approach fit with the evidence. One of his central findings was that politicians – the mayor in particular – were the most influential actors in the process, which is not what the “elitist” or “group” theorists would have predicted. “While there are important points of controversy between the group and elitist schools, the two share a belief that politicians are unimportant. . . . But in New Haven the mayor played the leading role in policy formation, activating and manipulating interest groups. More than anything else, urban renewal policy resulted from his ambitions, not those of private groups” (Wolfinger 1974, 12). Arriving at this conclusion entailed extensive analysis and contributions in areas of ethnic and machine politics, which are also addressed in two articles (Wolfinger 1963; Wolfinger 1965). Ray also conducted important research on party identification in the mass public. In addition to his first publication (Greenstein and Wolfinger 1959), he collaborated with five UC Berkeley graduate students on a conference paper, a journal article, and finally a book on partisanship in the United States (Keith et al. 1977, 1986, 1992). The central question they sought to address was how to interpret the growth in the number of people who considered themselves “independent” voters. By the 1970s, 1 in 3 Americans identified as independent, and many scholars and pundits predicted a host of potentially calamitous consequences: political instability, the collapse of the party system, and even the “loss of democracy” (Pomper 1977, 41). Ray and his students found that the vast majority of people who said they were “independent” nevertheless thought and behaved like partisans. These independent “leaners” constituted most of the people identifying as independents, leaving true or pure independents at just around ten percent of the electorate. What most people thought about the political significance of the growth in independents was not consistent with the evidence. Ray and his collaborators’ careful empirical work made it clear that whatever the causes, the growth in political independents meant little politically. Ray’s most enduring research interest was voter turnout. He studied the demographics of turnout, analyzed the effects of registration and voting laws on turnout, examined the political consequences of unequal turnout among groups, contributed to the development of the “motor voter” provision of the National Voter Registration Act of 1993, and made it a focus of his remarks when dining at the White House with President Clinton and several other eminent political scientists. Ray’s work on turnout began with Steven Rosenstone, at the time a UC Berkeley graduate student. The two took advantage of the fact that in addition to its extensive collection of demographic variables, the Census Bureau’s Current Population Survey (CPS) included registration and turnout questions in November of election years. They supplemented the CPS data with a detailed compilation of data on voter registration laws across the states. After combining the datasets, they were able to analyze turnout with both individual-level and state-level (registration laws) predictors. No one had done this before. 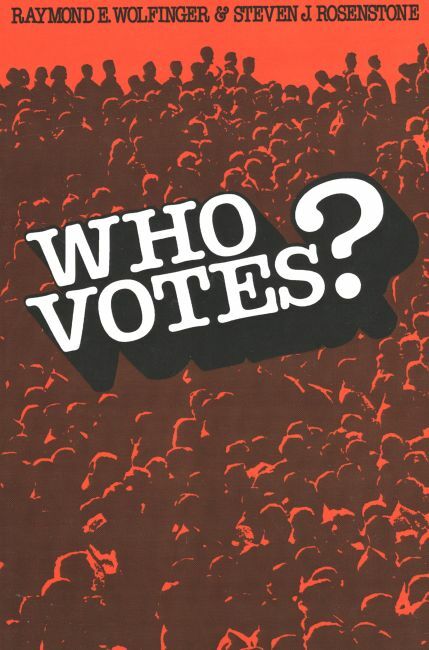 Their research led to an article in the American Political Science Review (Rosenstone and Wolfinger 1978) and Ray’s best known and most influential work, Who Votes? (Wolfinger and Rosenstone 1980). The book is notable for its attention to the separate and joint influences of laws and individual characteristics on turnout. Reviewing Who Votes? in 1981 Stanley Kelley wrote that “I do not expect soon to see a book that surpasses the achievements of this one” (Kelley 1981, 219). Judging by the book’s more than 2,600 scholarly citations, he was correct. Ray’s work with Rosenstone concluded with Who Votes?, but his research on turnout continued with many other Berkeley students. With David Glass and David Magleby, Ray coauthored an American Political Science Review article that focused on residential mobility and voter turnout (Squire et al. 1987), a piece notable not only for its scholarly contribution but its public policy recommendations. Finding that people who move “are less likely to vote for no reason other than the need to reregister and the low priority that this action has,” they recommended “linking the maintenance of registration to an action that is usually an intrinsic part of moving that followed from the findings.” Because most people have drivers’ licenses and update their address with the DMV when they move, linking re-registration to license updates made obvious sense and became the signature provision of the National Voter Registration Act of 1993 (NVRA), often called the “motor voter” law. In his later work on turnout, Ray worked on assessing the effects of the NVRA (Highton and Wolfinger 1998; Wolfinger and Hoffman 2001), whether jury aversion lowers turnout (Oliver and Wolfinger 1999), and the political implications of different turnout rates across groups (Highton and Wolfinger 2001). In his last article, he analyzed the effects of marriage, divorce, and children on turnout with his son Nick (Wolfinger and Wolfinger 2008). Over the course of his career, Ray received many honors recognizing his sizable contributions to scholarship and the discipline of political science. Early in his career he was awarded an APSA Congressional Fellowship and a fellowship at the Center for Advanced Study in the Behavioral Sciences. He was a Guggenheim Fellow in 1965 and a Ford Foundation Faculty Research Fellow in 1970-71. Ray was elected a Fellow of the American Academy of Arts and Sciences in 1983. He retired as the Heller Professor of Political Science at UC Berkeley. Ray was also an active member of the profession. He participated in the Study of Congress sponsored by the American Political Science Association. He served on the NES Board of Overseers for nine years and chaired it for four. Ray was a longtime member of the American Association of University Professors and served as President of the UC Berkeley chapter for two years. He consulted on the Micronesian independence plebiscites in 1983. He served on the Committee on the Status of Black Americans of the National Academy of Sciences and was a co-authors of the resulting book, A Common Destiny: Blacks and American Society. Ray also served as a visiting consultant to the British Economic and Social Research Council on the design of the British Election Study. Over his career, Ray mentored and advised an extraordinary number of graduate students. He chaired many dissertations at Stanford and Berkeley, co-authored numerous articles with his students, and advised many more informally. Many of his students have risen to the top ranks of the profession. More important, his students – irrespective of what their career paths have been – feel gratitude and appreciation for the help, attention, and friendship Ray extended to them. In retirement Ray continued to pursue his longstanding passions, including gardening, farming, and wine drinking. He died peacefully at his home in Berkeley, California of Alzheimer’s disease on February 6, 2015. He is survived by his wife, Barbara Wolfinger, and his son, Nicholas H. Wolfinger, Professor of Family and Consumer Studies and Adjunct Professor of Sociology at the University of Utah. Several years ago Ray’s former students established an endowment in his honor. It supports graduate students engaged in the empirical study of American politics at Berkeley. Contributions may be sent to: “UC-Regents—Wolfinger Family Fund,” University of California, Berkeley, University Relations Gift Operations, 2080 Addison Street #4200, Berkeley, CA 94720-4200. Campbell, Angus, Philip E. Converse, Warren E. Miller, and Donald E. Stokes. 1960. The American Voter. New York, NY: John Wiley & Sons. Greenstein, Fred I., and Raymond E. Wolfinger. 1958. “The Suburbs and Shifting Party Loyalties.” Public Opinion Quarterly 22: 473-482. Highton, Benjamin, and Raymond E. Wolfinger. 1998. “Estimating the Effects of the National Voter Registration Act of 1993.” Political Behavior 20:79-104. ________. 2001. “The Political Implications of Higher Turnout.” British Journal of Political Science 31:179-192. Keith, Bruce E., David B. Magleby, Candice J. Nelson, Elizabeth Orr, Mark C. Westlye, and Raymond E. Wolfinger. 1977. “The Myth of the Independent Voter.” Paper prepared for presentation at the annual meeting of the American Political Science Association. Washington, DC. Keith, Bruce E., David B. Magleby, Candice J. Nelson, Elizabeth Orr, Mark C. Westlye, and Raymond E. Wolfinger. 1986. “The Partisan Affinities of Independent ‘Leaners’” British Journal of Political Science 16:155-185. Keith, Bruce E., David B. Magleby, Candice J. Nelson, Elizabeth Orr, Mark C. Westlye, and Raymond E. Wolfinger. 1992. “The Myth of the Independent Voter.” Berkeley, CA: University of California Press. Oliver, J. Eric. 1999. “Jury Aversion and Voter Turnout.” American Political Science Review 93:147-152. Pomper, Gerald M. 1977. “The Decline of Party in American Elections.” Political Science Quarterly 92:21-41. Rosenstone, Steven J., and Raymond E. Wolfinger. 1978. “The Effect of Registration Laws on Voter Turnout.” American Political Science Review 72:22-45. Squire, Peverill, Raymond E. Wolfigner, and David P. Glass. 1987. “Residential Mobility and Voter Turnout.” American Political Science Review 81:45-66. Wolfinger, Nicholas H., and Raymond E. Wolfinger. 2008. “Family Structure and Voter Turnout.” Social Forces 86:1513-1528. Wolfinger, Raymond E. 1963. “The Influence of Precinct Work on Voting Behavior.” Public Opinion Quarterly 27:387-198. ________. 1965. “The Development and Persistence of Ethnic Voting.” American Political Science Review 59:896-908. ________. 1974. The Politics of Progress. Englewood Cliffs, NJ: Prentice Hall. ________. 2001. “Registering and Voting with Motor Voter.” PS: Political Science and Politics 34:85-92. We got to know and greatly like the Wolfingers and Young Nicholas when I was a visiting scholar at Stanford during 1969-70. I stayed in touch for a while with Ray for a few years but it then petered out. My main contact thereafter was with Polsby and Ranney. Thank you for your note, Dennis. I knew Polsby & Ranney all my life until they passed away. Ranney was my dad’s oldest friend. I was fond of him myself.